Randwick Electricians are proud to work in the beautiful suburb of Waverly. As a company, we enjoy building long-term relationships with repeat customers. It helps us understand every individual’s unique situation and provide the best advice and service that we can. Call Randwick for your next electrical upgrade or repair—it’s likely that you’ll keep us on speed dial to solve future problems that come up! Enjoy your outdoor spaces with sophisticated outdoor lighting choices. A little advice from the professionals can go a long way before you install or renovate lighting on your patio and garden. We can bring you up-to-date services, including energy saving options. Randwick Electrical would like to be your go-to electrician in Waverly. Want to make your home more energy efficient? We are a friendly team of electricians who understand that you want a reliable and cost-efficient solution. 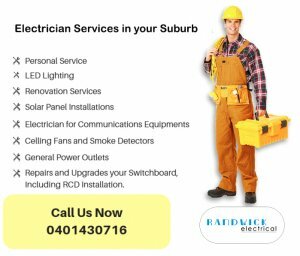 Look no further than Randwick Electrical Services when choosing an electrician for your home. For a no-obligation quote, or to simply ask us a question about your electrical requirements. We want every family to meet their energy efficient goals and inspire the next generation to take care of our beloved country. It’s the truth: most of our customers use Randwick Electrical services for life. That’s because they find our services to be efficient and reliable. As a company, we enjoy building long-term relationships with repeat customers. It helps us understand every individual’s unique situation and provide the best advice and service that we can. Call Randwick for your next electrical upgrade or repair—it’s likely that you’ll keep us on speed dial to solve future problems that come up!